In all seriousness, data loss is no joke. The goal of this post is not to preach about it, but to share some practical advice on backing up your important Salesforce data. I’ll cover two scenarios. First–the when, and second–the how. This is by no means exhaustive, but hopefully this tip sheet will aid in your project planning in the future. 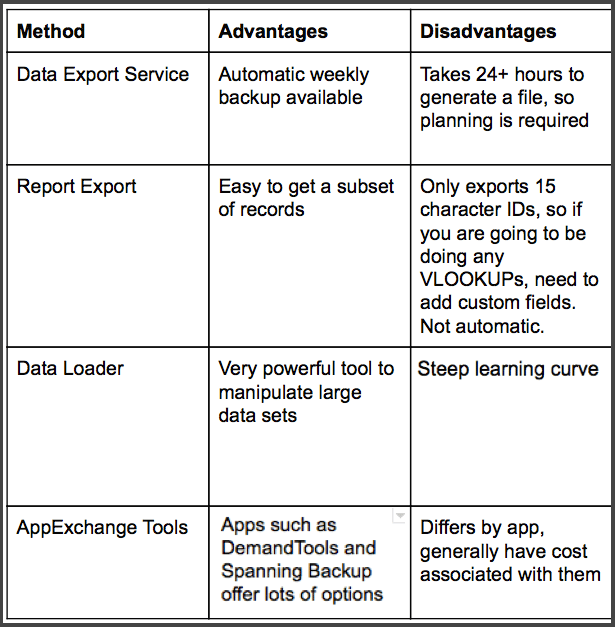 Every Week – You should take advantage of the Salesforce Export Service on a weekly basis. Download the file and add it to your network so you get a weekly “snapshot” of all of your company’s data. When Activating a New Workflow Rule or Process – Both of these actions change data. It’s best to have a “before” of affected data before turning it on! When Installing an AppExchange Package – Sure, we can guess that they will all act benign and not have negative impacts on data, but you never know. When Installing or Changing Settings on an Integration – Changing field mapping? Adding a new email integration? Whatever you’re doing, you need to back up related data (at the very least). Prior to Conducting any Bulk Data Operation – Going in and deleting all those 2004 Opportunities? Get a full backup of all Opportunities AND related data (Line Items, Products, etc). Updating a bunch of records? The same–back up that object so you have a “before” in case you forget to use 18 character IDs in your VLOOKUP formula! Before Deleting Fields – Even unwanted fields often contain data. Hopefully you’ll never need that data again…hopefully. Backing up is not one of the more exciting or fun tasks we do as Salesforce experts–but it’s an important one. If you’ve got other advice on the topic, be sure to drop a note below or hit us up on Twitter: @redargyledotcom. Both these solutions backup data and metadata daily to their cloud based storage. Right on Jason! Thanks for the excellent suggestions. They are indeed great tools!